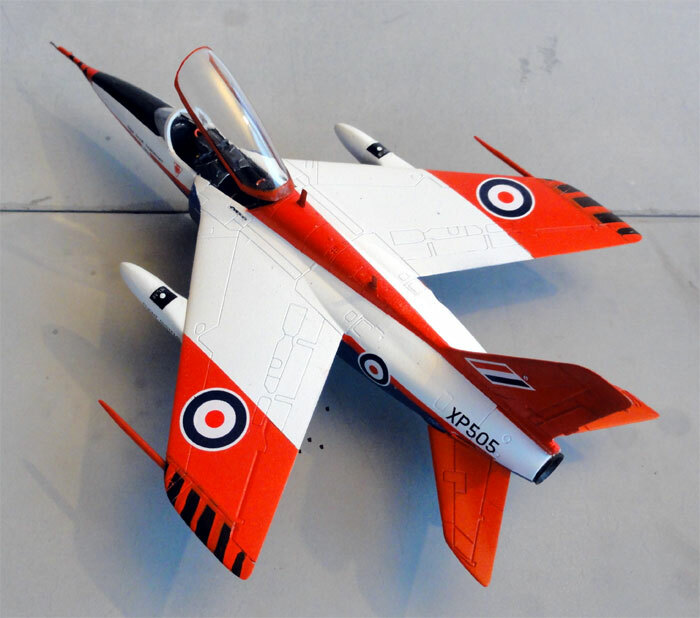 The Gnat was a small swept-wing British light fighter aircraft developed by Folland Aircraft. The Gnat was a two seater but also a single seat version was developed called the "Midge"which was a limited success but was sold to Finland. The Gnat was also flown extensively by the Indian Air Force including a single seat variant, called the "Ajeet". 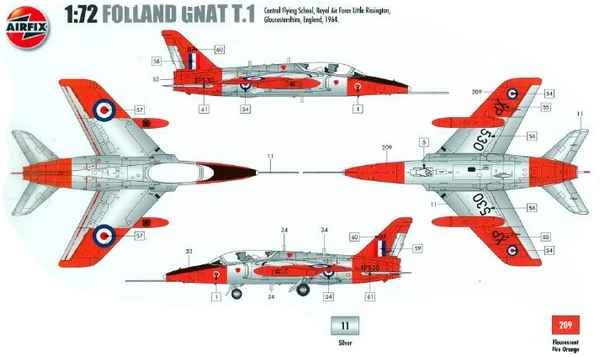 The two seat Gnat was the trainer variant. The Midge first flew in 1955 and was of a simple design with a swept wing. It was kept small to reduce costs and to meet the 1952 Operational Requirement OR.303 calling for a lightweight fighter. 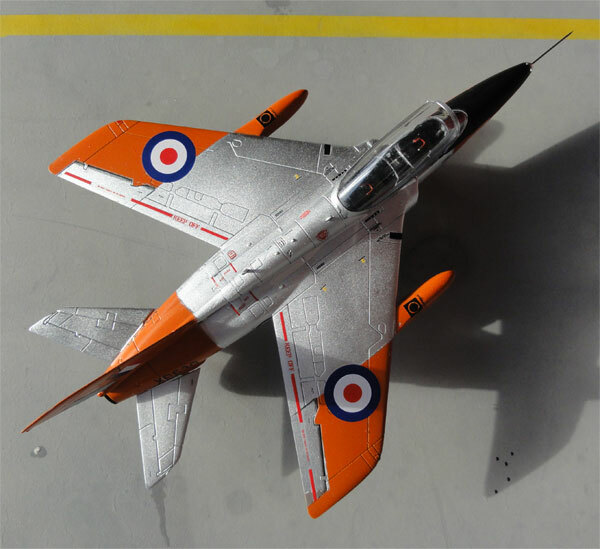 The Royal Air Force lost interest in the fighter, but needed the Gnat as a two-seat trainer as step up for training towards particularly the English Electric Lightning. 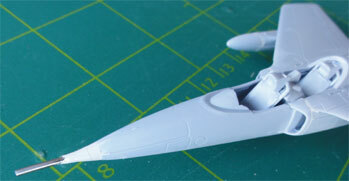 A more powerful Orpheus engine was installed and larger tail surfaces fitted. The inboard ailerons were also changed to outbound ailerons and conventional flaps. 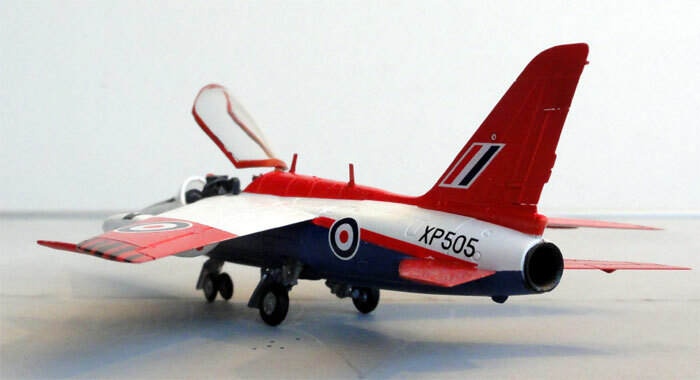 The prototype Gnat Trainer first flew on August 1959 from Chilbolton airfield. After a while, production orders were given for the RAF beginning of the nineteen-sixties. The first production Gnat T.1 aircraft for the Royal Air Force were delivered in February 1962 to the Central Flying School at RAF Little Rissington. 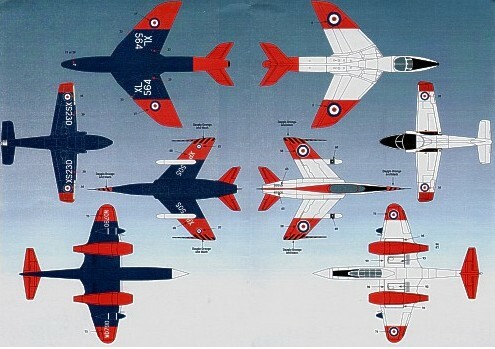 Over 100 aircraft were build by the Hawker Siddeley company, who had taken over Folland. 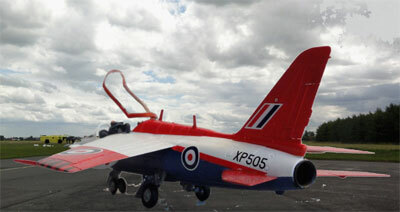 The Gnat was also used a lot at RAF Valley, the major training base in the UK. 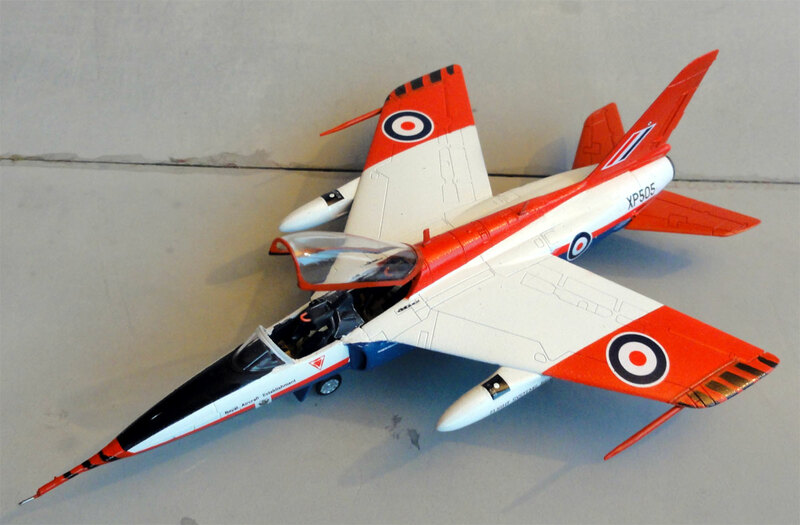 In 1964, the Gnat was also used by the RAF aerobatic team Yellow Jacks, later to become the famous RED ARROWS. The Gnat went out of RAF service in 1978. 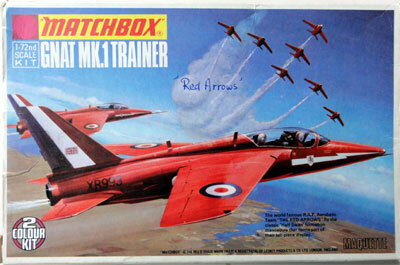 Matchbox/ Lesney issued a nice little Gnat in red and yellow plastic with a RED ARROWS scheme. Some peculiars of this kit are seen here. A friend of mine made the model over 20 years ago. But what about other 1/72 scale kits? 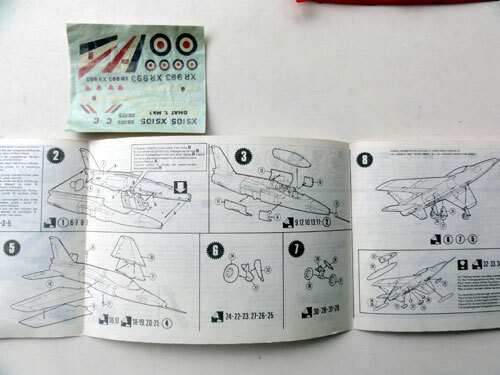 In 2012 , Airfix came with a complete new kit. It is excellent with fine recessed panellines, very good detail and very good decalsheet (although for 1 aircraft). It has about 50 parts and is very cheap! Lots of them can be bought and made for the model collection, so I got 2 kits. 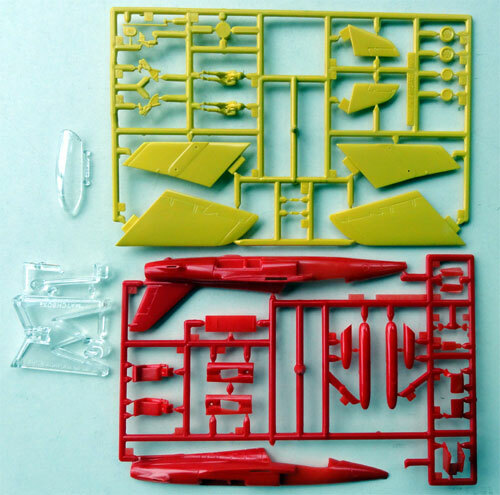 The kit plastic is very soft, so take care when cutting loose the very small parts. This model really is a straight forward build, and the model was made as per instructions. 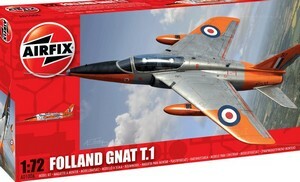 The scheme is for the RAF Central Flying School Gnat. 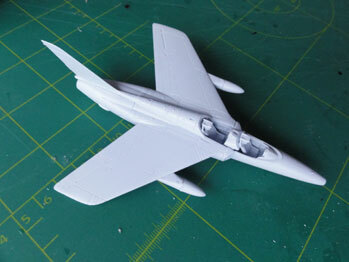 Filler was needed particulary at the intakes and the underwing leading edge tanks. 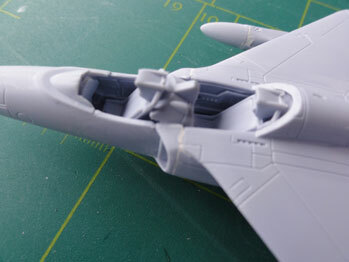 The parts are very very fine, so I had some very tiny gaps at the fuselage joints as well. Small amounts of putty were set and sanded after drying out. Filler was also needed at the rear fuselage. 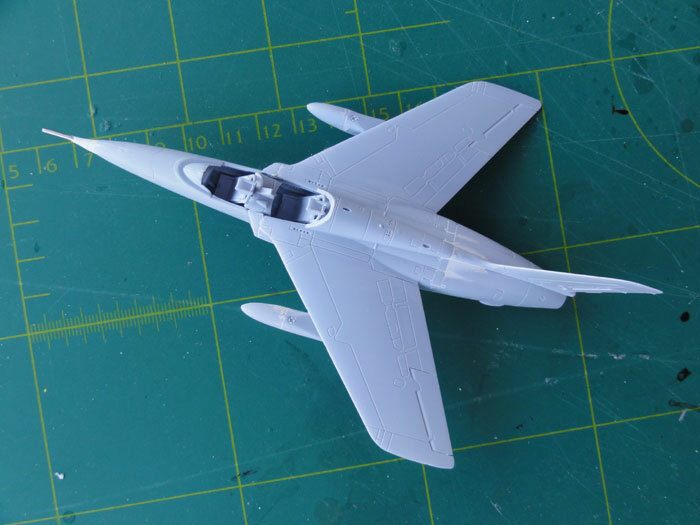 The control surfaces like the ailerons, rudder and flaps got sawed in gaps, done with a TIGER razorsaw. This makes things look better. Most work with this scheme is to apply the colourfull scheme as in the kit, with a nice aluminium scheme and bright orange panels. For the Aluminium/ natural metal: ALCLAD II with normal aluminium; note that I did NOT apply a goss black coat here first as instructed by ALCLAD. I thought that would a bit too shiny for such a small model. 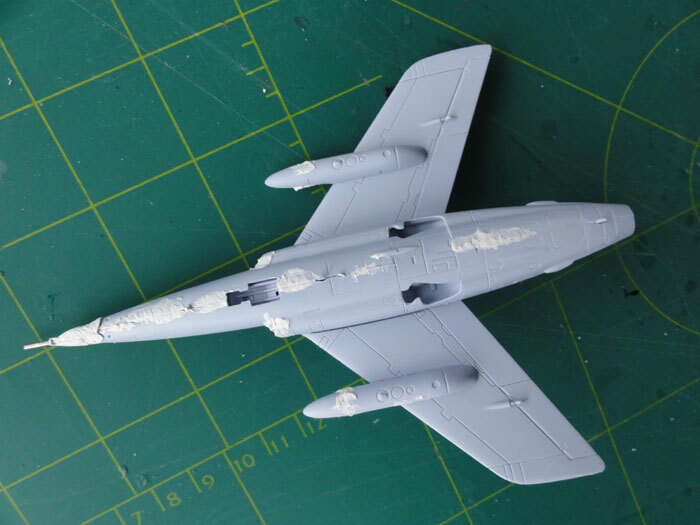 NOTE: masking the wing tanks is a lot of work, but you can not fit these tanks later on, as they do not fit very well, filler and sanding is needed. A lot of very small stencilling is on the decalsheet and it took quite some time to apply all the decals. The cockpit go some extra detail, particuylarly the missing clear screen between the forward seat and aft seat. 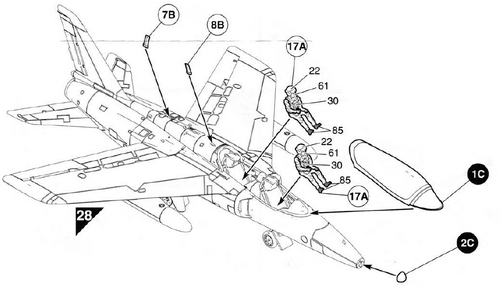 This screen protects the rear pilot during a bird strike or ejection. 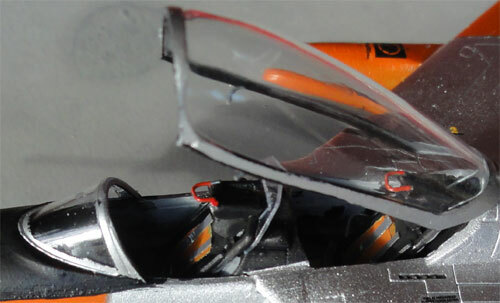 Most cockpit details are medium grey with black details. The seats go traps made from decalstripes and tape. Cockpit hood and windscreen were handpainted. The nose pitot was replaced and made from a metal needle. In the cockpit, only the seats got a ejection release handle on top of the seats. For the instrument panels, kit decals are supplied. 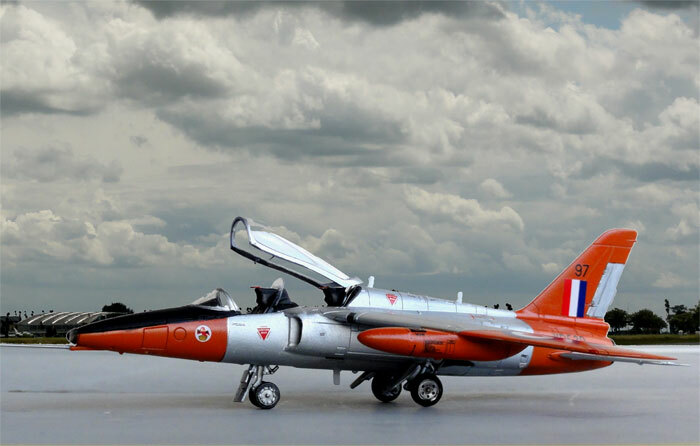 After applying the decals as per instructions, the model got a decal protecting coat of Johnson Future/ Pledge with the airbrush. A nice addition to my British trainer model collection. The second model was finished as a test aircraft at RAE Flight Systems at Bedford, UK, 1982. I got a nice decal sheet from AIRDECAL, set 7211, Raspberry Ripple PART 2. This Gnat is a T1 with a special nose pitot and wing tipe probes, seen above in a museum. 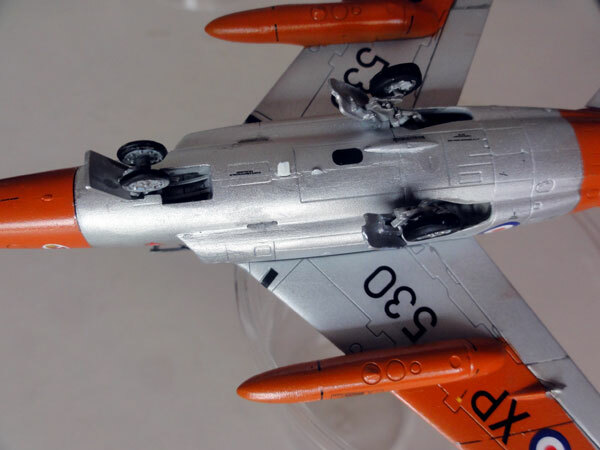 The new Airfix kit was assembled as indicated above, but a long nose tube was added. This tube was made from a metal needle. A gap was drilled into the nose to get a string joint. The tube was blended into the nose with filler. At the wingtips, also 2 probes are needed but these are set on later to avoid breaking them off. I did not bother too much about the cockpit interior, and the midscreen was not fitted as I could not see it on pictures for this Bedford test aircraft. In the cockpit interior, I applied a black interior coat for the test aircraft. The seats got a ejection release handle on top of the seats. For the instrument panels, kit decals are supplied. The RAE Bedford paint scheme is quite challenging, but fortunately the AIRDECAL 7211 sheet does provide the red demarcation lines and the decals are accurate. The decals are quite brittle but went on fine. 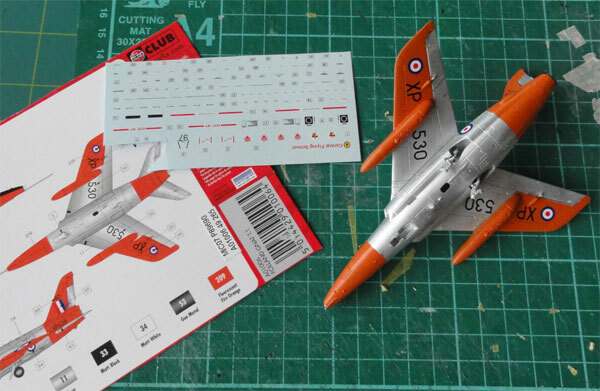 I only added a few stencilling decals from the Airfix kit, not a lot was discovered on actual Gnat T1 pictures of the Bedford aircraft. 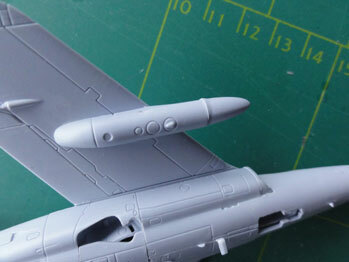 The 2 wing tip probes were added made from plastic rod. The black striping on the wing tips and nose are NOT on the decal sheet. These black stripes were marked with a black waterproof marker. Note the large probes on the wingtips and pitot on the nose.